2019 Polaris Axys Suspension Packages Now Available for Pre-order! 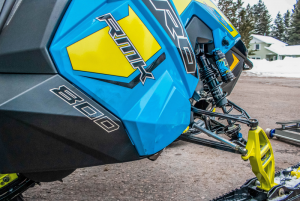 For the 2019 snow check Axys RMK, Polaris made a number of new design and geometry changes to the front suspension, along with the addition of the new 850 Patriot engine. The React front suspension includes shorter a-arms, changes to the swaybar, new spindles, and calibration changes with lightweight springs packaged in an adjustable ski stance that ranges from 36” to 38” widths. We were able to get our hands on some early production vehicles for development and testing to get our new shock packages dialed in. 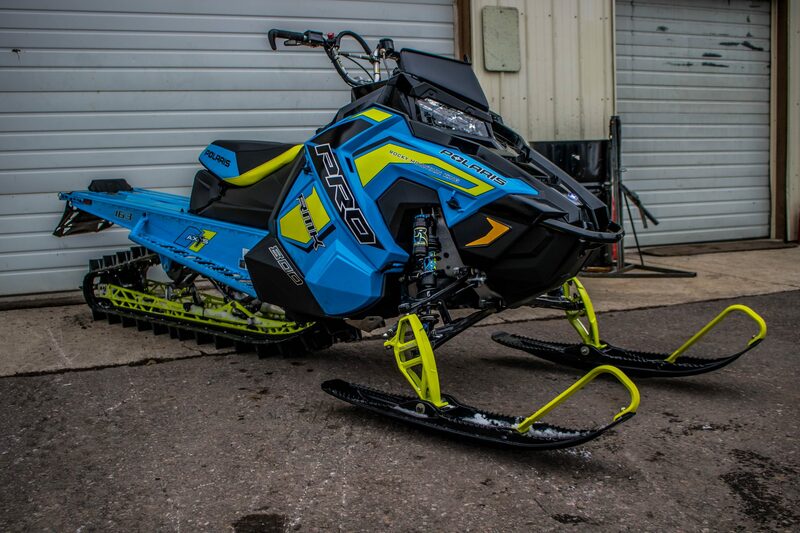 We took full advantage of some awesome late season riding conditions to put that new vehicle through its paces. The added power and smoothness of the 850 Patriot engine was clear right away, much like the 850 was on the Skidoo G4 models. The production shock calibration feels very similar to last year’s calibration with the addition of the new SLS springs. We feel there continues to be significant room for improvement after spending ample time on this vehicle in a variety of situations over a two week time frame. Raptor Shocks has always been known in the industry for their highly progressive, ultra-compliant shock packages. Our multi-rate springs as well as our newly calibrated shocks for 2019 turn a very good vehicle into something pretty amazing. Taking the time to tune and design shock packages that smooth out the small chatter, yet still have fantastic bottom out resistance over larger events, separates us from the competition. The majority of our customers realize how different the shocks feel within moments of leaving the truck. Whether you’re riding canyons or drainages, crossing over rutted up tracks can be gnarly on the stock suspension setup. Our shocks are designed to absorb those terrain challenges, reducing effort needed for riding corrections and giving much greater sled predictability. The result at the end of the day is significantly reduced rider fatigue and a much safer, more enjoyable riding experience. Whether you spend 150 days a year on the snow or 10, the suspension performance difference is immediately noticeable. Our new shock calibrations for the 2019 Axys React front end allow the rider to forget about what’s under the snow and really focus on their chosen line.